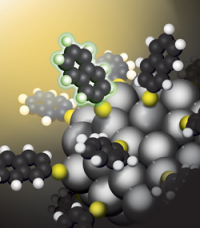 Artist’s rendering of silver clusters capped with organic ligand molecules. Center for Nanoscale Materials (CNM) users from the Ecole Polytechnique Federale de Lausanne in Switzerland, working with the Argonne National Laboratory's CNM Nanophotonics Group, have demonstrated the existence of long-lived charge-separated states in silver clusters. The clusters, synthesized chemically in solution, consist of exactly 44 silver atoms and are stabilized by exactly 30 organic molecules. Thus, the clusters exist at the boundary between the quantum-mechanical regime of small molecules and the classical regime of metal nanoparticles. Time-resolved optical measurements carried out at the CNM established that absorption of a photon by a cluster is followed very quickly  within a few picoseconds  by the separation of positive and negative charges within the cluster. 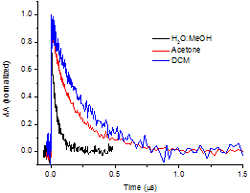 Transient kinetics showing charge recombination in ligand-stabilized silver clusters for different surrounding solvents (water-methanol mixture, acetone, and dichloromethane). Both charge separation and recombination events are faster in more polar solvents. The charges remain separated for a long time, as much as 300 nanoseconds. The stable charge-separated state, together with the fact that the clusters absorb light over a wide range of wavelengths, mean that the clusters represent a new and promising class of materials for solar energy applications.